For additional information about this book, visit the website www.precisvelo.com. For cyclists looking for an edge, a great place to start is with a training routine which focuses on the fundamentals. 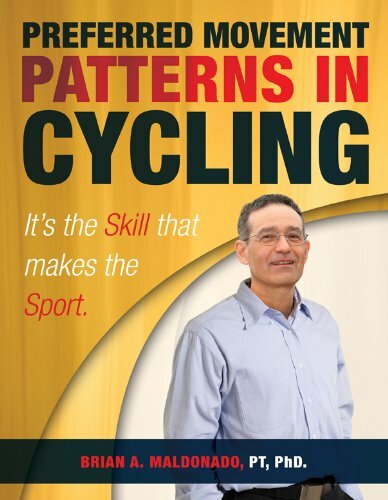 The concept of preferred movement patterns represents a fundamental transformation of conventional mindsets—the passive cyclist becomes, instead, a dynamic one. The result is greater speed, improved power output, and better performance. Using techniques such as the Trunk Pelvic Roll and Sidebend Hip Hike, author Brian Maldonado boldly challenges the preconception that the pelvis is fixed on the saddle, with hands and feet fixed on the handlebars and pedals. With detailed tips, exercises, and biomechanical analysis, this book gives coaches and athletes valuable movement patterns that can help them conquer their performance plateaus. Placed within a scientific context, the material remains easily applicable to the needs of those striving for the highest levels of performance. The result—a versatile program to bridge the gap from beginner to elite athlete—is in your hands. Brian A. Maldonado, PT, PhD serves the community of North Minneapolis and vicinity at the St. Olaf Community Campus as a physical therapist. Enhancing lives and enabling residents to attain their highest functional potential. Brian is the owner of Précis Velo, a business dedicated to offering the best skills-based training tools for the benefit of the coach and athlete. Education: University of Western Ontario, Canada (MSc); Rush University, Chicago, IL (PhD, Biochemistry); University of Minnesota (Physical Therapy).